I hope you will all bear with me as blogs are not my forte, and hence I'm mostly winging it here and hoping it looks correct when I hit publish. I'm in my second year and Florida State, and incidentally am Brian's cousin, which would explain how I came to know him. Or rather how he came to know me. Nonetheless, I am studying photography and graphic design. I shoot freelance for the University's newspaper, and do other stuff when I feel like it. Sometimes I go dancing, and sometimes I eat tacos. But that's neither here nor there. I also got a Rubik's cube for christmas. I've been playing with it a lot lately. I beat it twice with the aid of the instructions. I'm not sure if that counts. 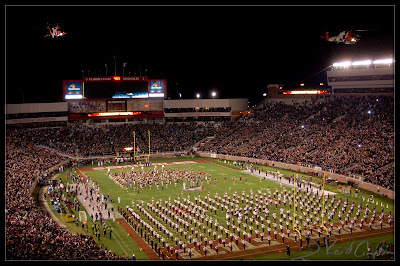 The picture I included is from a football game this past fall, FSU's homecoming game against Boston College. The Coast Guard did a flyover while the Marching Chiefs and the alumni band danced and tooted their merry horns on the field. So, it is a pleasure to informally e-meet all of you, and I look forward to seeing lots of pictures. Awesome shot. I love how open it is. May I ask what lens you used? And yes, I do believe that is cheating, lol.